When I first started watching cooking shows on TV, the first thing that I noticed that those cooks/chefs used lots of small prep bowls. I tended to chop things as I worked, when I needed them. This was especially true if I was making something like vegetable soup and there was no need to rush to get all the ingredients into the pot in a short window of time. But once I tried the prep bowl method at home, there was no doubt that it seemed to make the cooking process go a little smoother and faster, even though it meant that there were more bowls to wash.
Cook’s Illustrated tested a few mini prep bowls for durability and to see if they really did speed up the cooking process in a recent issue. They picked 6-oz Pyrex Dessert Cups and Totally Bamboo Mini Bowls, among others, and checked for stability and ease of cleanup. Their results found that the most versatile bowls – the oven/dishwasher/microwave safe Pyrex bowls – were the easiest to use and easiest to clean, not retaining smells of garlic and spices like some other bowls. The bamboo needed to be hand-washed only and retained strong smells. Plus, they were too small for some ingredients to be that useful. The Pyrex cups can also be used for baking souffles or serving puddings and other desserts, giving them multiple uses and making them more deserving of kitchen space, so even if you only use them sometimes for prep work, you’ll still find them to be useful. These things are fantastic! I don’t know what I’d do without them. They’re perfect for so many things, and you don’t even think about it until you have them. I have a set of 3 Pampered Chef prep bowls, with lids, that I love. In fact, I think I need another set. Though I would guess small Pyrex would work just as well (and I love my Pyrex), my PC bowls have 1/4 cup measurements on them. So useful! I love prep bowls. It makes cooking a lot easier. 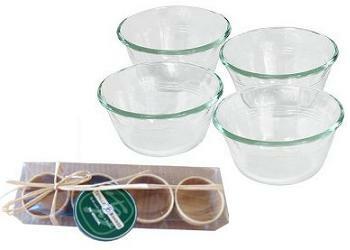 I have had small pyrex bowls in my kitchen for years. They are also great for baby food. I bake in the often. They have so many uses. I even use them to collect nuts and bolts when taking things apart. I love my pyrex bowls, large and small. Couldn’t do without them. I actually got the Pyrex mini bowls also because they are ovenproof and I can bake portion controlled crumbles anytime. But then, baking, since I need all the ingredients to be at room temperature, I usually start by prepping the butter, and then to save time, I measure all the other ingredients, flour, eggs, sugars, chocolate chips… and have them ready to go on the counter in the bowls. It saves you time and space when afterwards you are incorporating, you can just drop anything in! charming post. due one unimportant where I contest with it. I am emailing you in detail. charming post. due one detail where I contest with it. I am emailing you in detail.